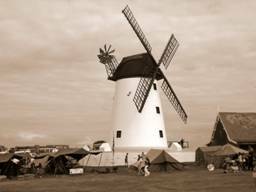 Lytham’s 1940’s Weekend has grown from strength to strength over the past five years. 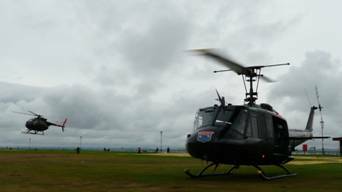 This year the organisers broke the mould and invited us to take the Huey and the Loach and introduce the huge crowds to another conflict; the Vietnam War. 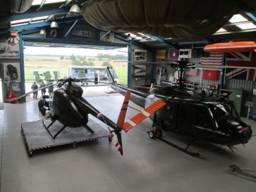 We were approached earlier in the year and arranged to give them a guided tour and a talk about what we do at the hangar. We obviously made the right impression as they invited us to take part in the weekend in August. 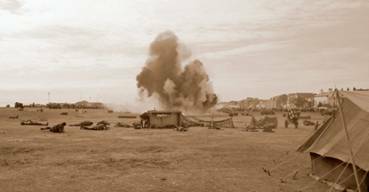 As the event has encampments of re-enactors/living history groups we felt it would add an extra element if we could get our living history group the 2/327th ‘No Slack’ involved. We spoke to Mark and Judith who are part of our ground and air crew but are also our connection to the No Slack Living History Group. They went away and discussed it with their other members who live far and wide. Unanimously they all agreed it would be a great event to show off just exactly what they do, but to tie it in with the Huey and Loach - something that has not been done like this before. They came up with a plan of what they thought the layout could look like and the organisers allocated us a large space at the western end of the Green which would be away from any tents that had been erected ahead of the event (downdraught being what it is!!). The members of the full team started to converge on the North West on the Thursday before. Mark and Judith had packed up all their tents, cots, ammo boxes dummy barbed wire that afternoon into the van and waited for the arrival of the other members of the group to load their equipment as well. The whole team were to meet at the hangar for around 1230hrs. This would give us time to fully brief everyone as to the layout of the site and get over to Lytham to sweep the area before the helicopters were due to land at 1530hrs. We convened in the conference room in the hangar. Firstly Phil told us that we had been relocated further east on the Green as the site of the battle re-enactment had had to be moved. We were now in the heart of the event and had a large area to land in. With this in mind we had to slightly change our plans but not too drastically. To add to the impact of the arrival of the helicopters we also decided that, weather permitting, we would fly with the doors open and members of the 2/327th on board as door gunners and aircrew. Neil was Piloting the Huey and Phil the Loach. We decanted everyone’s kit and equipment into the vehicles heading off to Lytham Green first. We set off a little after 1400hrs to meet up with the organisers. I took my Jeep and trailer, both fully laden, followed by Patrick with his loaded car behind. The others followed in the van which was crammed with everything we needed to build up a full squad tent as it would have been. We were greeted by Becky who had gone on ahead to meet up with Viv the organiser and to arrange stewards to keep the area clear for the arrival of the two helicopters. Mark and I recce’d the site and paced out where we needed the two helicopters to land, giving us room for the tents to be pitched between them. We also worked out the area needed for the motor home/shop and camp behind it for the rest of the crew accommodation. Happy that everything was good we agreed a time with the Organisers/Stewards for the area to be locked down and we put a call into Phil. The plan was for them to fly west from Wesham along the M55 to Blackpool. From there they would turn south and fly along the coast. On arrival at Lytham they would turn out into the estuary and then turn back in land towards The Green. I was landing Neil on the western edge of the site close to the Lifeboat Station and Phil in the Loach east of that by some sixty feet or so. Viv and her army of stewards returned at 1530hrs and set themselves up at various points around the perimeter. At 1540hrs the sound of the Huey came clattering down the coast soon follow by the visual sighting of her. The Loach was behind and higher but at this point couldn’t be heard .... I wonder why? Both aircraft thundered and buzzed past and turned away from The Green. Neil turned the Huey around and headed straight towards me. Without any fuss he followed my guidance, I brought him forward and brought him down on the firm flat patch of ground we had decided was the best position for the Huey. I left Neil to go through his shut down procedure and headed off to guide Phil in to his allotted spot. As sweetly as anything Phil eased the Little Bird forward and placed it on the ground. Engines shut off and blades stopped the next phase kicked in. and started to unravel the tent. In no time at all it began to look like a tent but with one big difference - its size, some thirty feet long. It was then followed by a much smaller ‘Hex’ tent being put up, not until an extra wooden pole had been located (Becky said to ask Dutch about it?!). That was soon up and both tents then had the equipment set up inside. The squad tent had all the ‘cots’ set up with footlockers in place along with chairs and everyone’s personal kit set up. 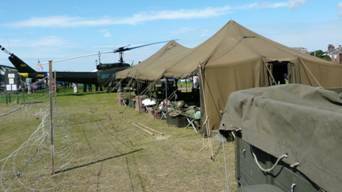 The Hex tent was kitted out with the radio equipment needed to act as an operational control point to dispatch the helicopters. Whilst all this was going on a protective fence was being erected using dummy razor and barbed wire. The motorhome arrived so we set about setting up the awning and shop. Another Jeep turned up and that was parked inside the compound. By around 2000hrs we were just about sorted so we could settle down and get a bite to eat and relax before turning in for the night. Saturday morning dawned bright but slightly breezy. People were up and about and in search of breakfast, which was found not too far away in The Queens Hotel. We had to stagger breakfast as from the word go there were people coming to have a look and a chat about the camp set up. Some of us went to the Vinyl Groove cafe just off from the front and very nice it was too. Saturday was very busy all day long. There was great amount of interest shown in both helicopters and in the squad and hex tents along with the team that make up No Slack. 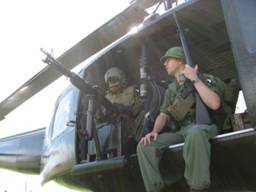 It was a great photo opportunity and a chance to see what it must have been like with the Huey loaded with equipment and men. Seeing the No Slack team in full combat gear really brought it home to people just how the ‘Grunts’ looked like whilst serving in Vietnam. It also helped to show that although the Huey is big, it suddenly becomes a lot smaller when you get the full aircrew and up to 8 GI’s all on board. The shop did a brisk trade keeping Jo and Nina busy all day long. We had a big team as there were eight members of the No Slack group and seven of the Huey crew. All were kept occupied by those that came to talk to us. Miraculously mugs of tea and sandwiches kept appearing keeping us all going. By 1700hrs hours we were well and truly ready for a rest. We packed up some of the gear and sorted out our evening meal and refreshments, all well earned. Sunday started slightly breezier than Saturday but promised to be sunnier which it was. Neil arrived early to join us for the day and man the fort, so to speak. We thought Saturday had been busy but Sunday was even busier. We had some interesting discussions with the public and as with the day before after they had found out that we had flown both aircraft in, they all wanted to know what time we would be flying out. 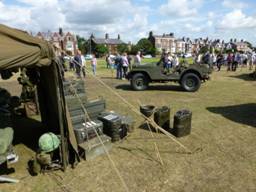 Throughout both days there were parades of military vehicles around Lytham. There was also a battle re-enactment that involved a lot of pyrotechnics going off and lots of blank ammunition being fired; all dramatic stuff. 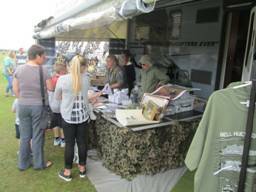 Besides that, there were stalls selling everything for the 1940’s enthusiast and a lot more besides. Our friends from the Lytham Spitfire Group put on a great show with not just one but two Spitfires on static display. As it is a public event we cannot fly until it is officially closed which would be 1700hrs. We then would need to pack all the kit away and take the tents down then make the area safe for the two helicopters to take off. This meant that we wouldn’t be flying for at least an hour after the event closed. 1700hrs came and the work began to break camp. Phil and Neil had done their ‘A’ checks earlier that afternoon on the Huey and Loach which created a lot of interest amongst the public. Like a well oiled machine everything disappeared remarkably quickly and down came the tents. The shop and awning were packed away and vehicles were moved as were the crowds by Viv’s army of stewards once again. A little after 1800hrs we were in a position to get the helicopters out of Lytham. A new crew were allocated for the Huey which was being flown out by Neil. They were briefed and they climbed aboard. Phil climbed into the Loach. Whilst they made their final checks we on the ground made our final checks to make sure the perimeter was secure and no-one had got to where they shouldn’t be. All was good and the helicopters were cleared to start. Up and running, final walk rounds done, Phil and Neil prepared to lift. Both aircraft rose and turn around and flew out across the estuary. They circled to the east before heading west to then fly along the coast before turning east again to head for Wesham. Those on the ground jumped into the various vehicles and hit the road. It was an excellent weekend doing something we hadn’t, but always wanted to do, which was to try and create a Vietnam War experience. 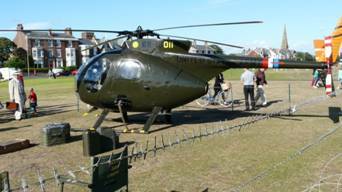 Hopefully it brought a new dimension to what we do at public events and to the Lytham War weekend. 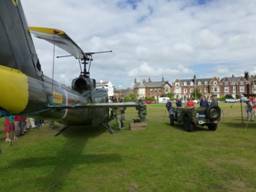 Huey 509 and Loach 11 were flown into the Lytham Wartime Weekend event, arriving on site mid Friday afternoon. The reason for this was to land and shut down so our tented encampment and motorhome shop/display could be set up alongside the helicopters before the event opened to the public first thing Saturday morning. 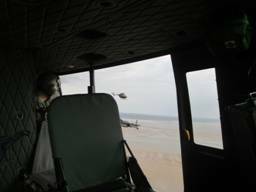 Our flying was a direct transit from home base, overhead Blackpool airport, 600ft transit offshore along the coast to recce the prepared and secured landing site for arrival. The sound of the Huey advertised our impending arrival well before we actually arrived! Both the Huey and loach made an approach from the sea towards the landing area and were marshalled into final shut down positions. 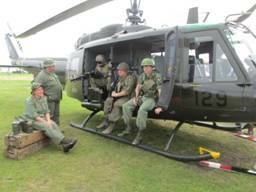 The weekend went very well with lots of interest in the Vietnam encampment we had all set up. A frequent question was how did we arrive on a truck? Folks were surprised to hear they were flyable and that we actually flew in! After the event closed on Sunday at 5pm, it was all hands to dismantle the encampment and clear the area for both Helis to start up and depart. We started up and took off out to sea and flew a racetrack pattern offshore at 600 feet above the sea until Blackpool Air Traffic Control cleared us to proceed onwards for an uneventful return back to base. We all enjoyed what turned out to be a very good event and we would all like to thank Lytham Council and all the associated organisations for inviting us to attend and broaden the scope from WW2 to ‘other’ conflicts. Hastily drawn sketches of plans and ideas always precede any event we attend for months beforehand. Plans are set and changed but when it comes down to the final stages it all hangs on the weather. We are about to attend an event at Lytham in Lancashire and of course heavy rain accompanies members of the 'No Slack' Vietnam Living History Group squad all the way from Portsmouth, Kent and Surrey to their overnight transit camp in Adlington, Lancashire - a garage suitably laid out with military sleeping accommodation! Friday morning breaks and the group makes its way to the Hangar to finalise the procedures and liaise with the aircrew for the lift to Lytham. 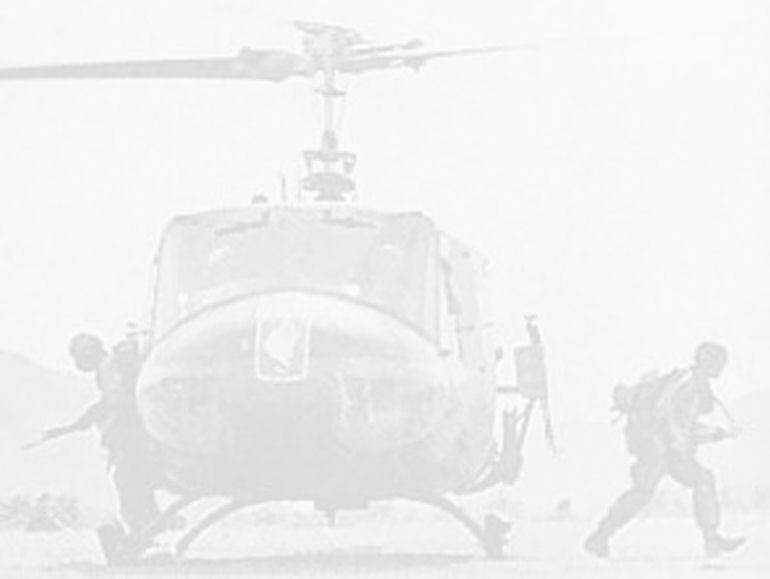 Zip is upfront in 509 with Lee & Ox on the 60's; the remainder of the squad must truck it over to the AO where they must prep the site prior to bringing in the helicopters. Derrick an 'FNG' or 'Newbie' is to join them there. A wet expanse of land awaits the ground crew who quickly pace out the required area for the camp and LZ for the choppers. It isn't long before liftoff is confirmed over the radio and the distinctive thump of the Huey draws attention skywards. Under the grey clouds the Huey and its sidekick Loach buzz the shoreline before hovering into their designated positions. Once on the ground, shut down and rotors secured the No Slack grunts move in, erecting a 32' long troop tent in minutes followed by a radio communications tent whilst razor wire is rolled out around the perimeter. 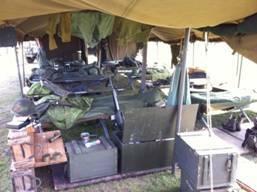 The troop tent, manufactured in 1967, is designed to accommodate ten men and so ten beds and all associated equipment for the men including rucksacks, weapons, ammunition and other paraphernalia is unpacked, right down to razors, cigarette lighters and toothpaste. 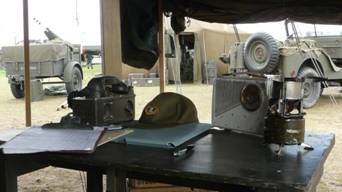 The radio shack is furnished with radio equipment, tables, chairs, field phones and paperwork. Electric lights are the final installation. Outside are supplies of 105mm Howitzer rounds and various other calibre ammunition boxes together with fuel and water cans and the ubiquitous mermite food containers, used to transport hot food in the choppers to troops in the field. Two jeeps and a trailer were 'purloined', not quite period authentic for the display but a little more for our public to see. All this was completed within 3 hours and then it was time to hit the town for some food! The Saturday weather was much nicer albeit much cooler than in Vietnam! Period recordings of radio traffic were played in the radio shack and in 509 making the atmosphere come alive. The last of our squad arrived from Glasgow and some of us changed uniforms to represent flight crews whilst the others put on their fully laden rucksacks for photo shoots with the Huey. Parked outside the radio shack was the Loach awaiting her next call, while a couple of guys on stand down listened to the radios keeping up with their aero scout partners flying another mission. Photographs and questions were the order of the day for both days and the ability to relay some of the stories passed down to us from our veteran friends were very rewarding. It's so nice to sweep away the political and movie perspectives and replace those with the real stories of those who mattered the most. Yes we all try to look cool with the hardware, with varying degrees of success I might add, but the long list of names on 509's door always reminds us that we do this to keep their memory in the conscience of today’s generation. Every event we do is dedicated to the very special veterans and their families we know ...... guy and girls you know who you are! Sunday was blessed with sun, the crowds grew bigger and as the show drew to a close it was finally time to vacate our AO. Equipment was packed and tents were dropped before the perimeter wire was removed. A huge crowd of onlookers sat in the sun as we busied ourselves prior to lift off. 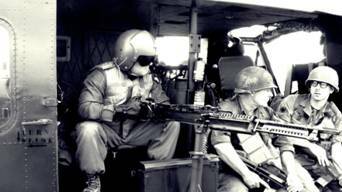 Dutch and Zip took up their duty as door gunners on 509, the remainder employed in ground and crowd control. The time to vacate what had been our home for the last three days had arrived and the two icons of the Vietnam War lifted off causing a tidal wave of dust from the former camp site. With a noise that makes the hairs on the back of your neck stand to attention they were up and away, the site empty and quiet once again. Mission accomplished. Our thanks to Viv Wood and her Team at Fylde Borough Council for inviting us to be a part of this great annual event.